How green is my valley. I don't know if it's me, the light quality today, or the fact that Vinoland's grapevines got a little extra TLC last night, but everything in Vinoland just looks wonderfully verdant today. The Pinot grigio grapes are definitely a little shinier: I'll explain. In the never ending quest to produce good quality grapes from disease free vines, preventing pests from damaging the grape crop calls for a combination of techniques, or integrated pest management (IPM). Along with cultural practices, sometimes chemical control, the use of pesticides, can be more effective in controlling pests (in the greater context of a broad IPM strategy). Yesterday evening was the first time Stylet-Oil (SO) was used on the grapevines (with a little Mettle® fungicide thrown in for good effect). SO is a little more effective against powdery mildew (Uncinula necator) (PM) in cooler growing seasons (like the one the Napa Valley is experiencing this year) versus the more conventional use of sulphur. Sulphur needs warmer temperatures to volatize (65°F is the recognised minimum temperature required for sulphur activity against PM), whereas SO is not temperature dependent and so it acts as an eradicant, protectant and, most importantly, an antisporulant 24 hours a day. In layman's terms, SO stops spores from growing, and insects from breathing. And it makes baby-grapes shinier. A very cheery, yellow flowered weed currently blooming in Vinoland is perforate St. John's wort (Hypericum perforatum) a flowering shrub native to northern Europe and thus named because it can be found flowering on the feast day of St. John the Baptist, which is today. The longest day of the year in the northern hemisphere, falls on June 21st (or thereabouts, depending on GMT) and is the occurrence of the summer solstice, whilst Midsummer's day is traditionally observed on the 24th of June. (The discrepancy in the date is said to have been exacerbated by variations in the Julian Calendar, only to be further confused by the Gregorian Calendar. Oh, those wacky Romans and Popes.) The two days are often confused; as are the somewhat dubious medicinal benefits attributed to St. John's wort. Methinks just looking at this sunny yellow flower would promote a positive mood in the biggest of whingers. Have a dreamy Midsummer's day, and night, everyone. Thomas Jefferson once said, "I have lived temperately...I double the doctor's recommendation of a glass and a half of wine each day and even treble it with a friend." Perhaps he was waxing lyrical about his fondness for the Montepulciano grape which he considered, "most superlatively good." I doubt he would have said the same about either of these two wines from Blenheim Vineyards, located just seven miles from Jefferson's Monticello plantation. Although not that bad, these wines were not that great. Both 2017s, the Albariño (Monticello AVA) and the Chardonnay (Virginia) were no Rías Baixas or no Chablis, respectively. But then again, they're not supposed to be, these wines were grown and vinted in Virginia, so one should expect totally different results. Both wines seemed to have quite a bit residual sugar, the Albariño being the most quaffable of the two. The slightly cloying sweetness just made the Albariño a little heavy and merely succeeded in masking the degree of acidity I was expecting. Blenheim Vineyards produce around seven varietal wines (their website shows that they produce some proprietary blends also), including a Rkatsiteli which I'd like to try, seeing as I had this varietal fairly recently. Alas, I procured these wines second-hand, so for now I will have to make do. The Rkatsiteli might be something I seek out in the future though. Tonight, I will definitely be looking in the refrigerator for a wine, to pair with dinner, with a little more acid: my taste buds need reviving. Yay! It's summer and Vinodog 2 has decided to don her ice cream goggles and embrace the change in season. We haven't had much of a summer yet in the Napa Valley, but "hope springs eternal in the human breast." Or is that, hope summers eternal...? Just kidding. V2 is a very happy little dog despite her often dour countenance in photographs, these silly sunglasses just serve to heighten her rosy outlook on life. And she makes me extremely happy as she is my ever-present companion in all my viticultural adventures. However, I hope she doesn't expect to wear those sunglasses out in the vineyard today, that would be just plain embarrassing. I may love V2 to death, but I'm still English. Standards, you know, old chap. Napa Sanitation District's recycled water is finally dripping in Vinoland. Today was the first time the grapevines have been irrigated this growing season. Well, I think the vines got watered, the wind was so brisk that it was blowing the water dripping from the emitters sideways. The amount of water the vines get, and the frequency of watering, depends on a number of different factors; soil type, climate, topography, grape variety, cover cropping, cultural practices, etc. In California's vineyards it is only the water that is held in the soil that is available to grapevines, any rare rainfall during the growing season is lost to surface evaporation, runoff, or used up by cover crops and weeds. Now, for the first time, due to the abundance of recycled water available, all the vines could be watered at once (instead of block by block). I will be keeping a close eye on the vines for any sign that they don't like their new source of sustenance as there has been some conflicting data over the salinity of the recycled water. Grapevines are more tolerant to salt than other fruit crops, but I'm not interested in performing my own mini-experiment. If there is the slightest hint of a problem, the plug will be pulled and it'll be back to well water for Vinoland's vines. A wonderful wine with dinner tonight. Hmm, I can't exactly remember when I bought this Robert Sinskey Vineyards, 2013 Pinot Gris (Los Carneros AVA), but I'm really glad that I did. Paired with shrimp for dinner, this wine was just gorgeous. A light, light brass colour, the nose was filled with a rich honeyed-butterscotchy, orange blossomy, limey-ness. (I don't believe any of those in reality are legal wine descriptors.) This slightly spicy, medium bodied white wine had lots of bright lime-citrus, Bramley apple skin tartness on the palate with a slight almondy-bitterness on the finish. Yum. And there you have it, a truly wonderful tipple. He's not my actual uncle, but thank you Bob Sinskey for making a fabulous wine. Now that's what I call food! Subtitle: In praise of the humble jam butty. I am from Northern England where a 'butty' is very definitely food (especially the two butty varieties, 'bacon' and 'chip'). Simply bread and jam, the individual components of a jam butty are equally as important. However the star of the butty in the photograph was Thud's homemade damson jam, a jar of which I brought back from Blighty with me in April, and which I just finished this morning. I am crying as I type. Incidentally, and I may have mentioned this before, damson is one of my favourite descriptors that I often find in Cabernet Sauvignon. Of course, I don't get damson in all Cabs, the same way as I don't get violets in all Cabs. The only person I have met in the U.S. to grasp damson as a wine descriptor was my professor at Napa Valley College, Dr. Stephen Krebs. Dr. K. had travelled widely in Europe, whilst doing research for Jancis Robinson, and had tasted this type of plum for himself. Speaking of food, recently all the staff at TWWIAGE, regardless of department, had to undergo a educational training session in food hygiene and safety, (we did last year also). The Food Safety Modernization Act (FMSA) was signed into law in January 2011 (by President Obama) and made extensive changes to laws governing food safety. The FSMA focus changed from responding to food contamination to preventing food contamination. (Everybody agrees that keeping pathogens out of food is a good thing, right?) Under this new-ish law, even "low risk" facilities, such as wineries, must be inspected within 7 years of the Act becoming law. That means that for the past 2 years the Food and Drug Administration (FDA) has stepped up its inspections of wineries. Hence our training session: FDA agents may show up at TWWIAGE at anytime. Now, under Federal law, wineries are considered "food manufacturing plants." But unlike other food manufacturing, the fermentation process that is the essence of wine is also very efficient in killing the very pathogens that would make folks sick. Due to wine's elevated levels of acidity and alcohol the only microorganisms that can survive in wine are yeasts, lactic bacteria and acetic bacteria. My take on food borne pathogens is an over-simplification, I admit, but it is this type of simple stuff that gets caught up in bureaucratic red tape. All. The. Time. I don't believe wine is a food. I generally think of food as something you can get your teeth into, like meat and potatoes (or a jam butty). Man cannot live on wine alone because it isn't food, in fact too much of it will kill a person, or at the very least will give the over-imbiber a very unhappy liver. Wine is a companion to a meal, not a meal in itself. Back in the Cabernet sauvignon vines, still stuffing shoots, bloom is progressing nicely and seems to be on track. It has been quite a windy spring, breezier than normal, but not too windy as to be detrimental to fruit set. A little breeze can help distribute pollen form the anthers to the ovaries; quite beneficial as the grapevine's flowers are hermaphroditic (or the 'perfect' flower). Carry on Mother Nature, you're doing a good job. Erm, wow! Apparently, I have been spending too much of my vineyard-time in amongst the Cabernet sauvignon (CS) vines. For most of the past two weeks I have been stuffing CS shoots like a mad woman. This time of year the CS gets to the stage where it can get a little unruly. If not for a little good-natured encouragement, and gentle coaxing of the shoots into the trellising wires, the vines would soon resemble Cousin Itt. I hadn't noticed that the Syrah vines were about 95% finished with flowering and there are BB-sized grapettes. Oops. The 2018 growing season, thus far, has seen bloom in the white and the black grapes much closer together timing-wise than it would be in a typical year: the flowering window has been effectively shortened. It's all good as it is these kind of differences that make a vintage. Last night, Vinomaker and I took ourselves to the Uptown Theatre in downtown Napa to see Brian Setzer and his Rockabilly Riot. I had last seen Brian Setzer in concert, with the Stray Cats, on the 21st of December 1981. Yup, quite a while ago, there has been a lot of life in between. The teenage Vinogirl loved Brian Setzer then and I still love him now. 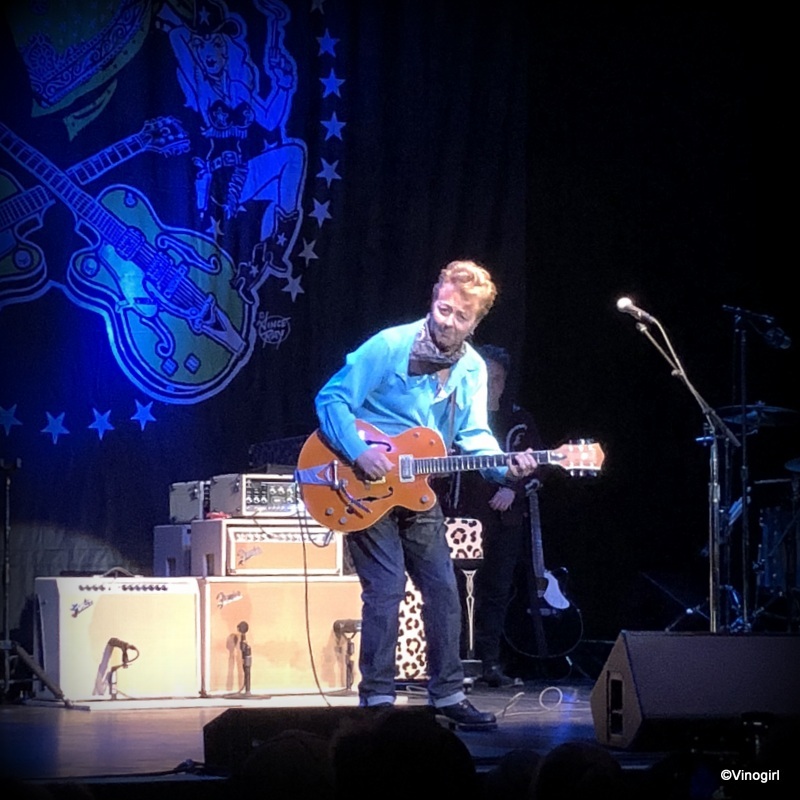 Always a Rockabilly fan (Johnny Burnette, Eddie Cochran, etc., thanks to Thud), when I discovered that Mr. Setzer was coming to Napa I just had to go and see him play. And what a treat it was, he was even better than I remembered. An added bonus to visiting the Uptown is that they have a bar and you can drink in your seat whilst watching a show. How civilised is that? Very adult. So I, and my glass of Mumm Napa fizzy stuff, settled in to enjoy the support band, "Drinkin' wine spo-dee-o-dee!" The support band, 'Miss Mary Ann & the Ragtime Wranglers' (from the Netherlands. Dutch Rockabillies, who knew?) were quite entertaining (their double bass player being particularly convincing) and successfully warmed up the crowd up for the main attraction. And then there he was, in all his pompadour-topped marvelousness, the man himself, Brian Setzer. Go cat, go! Simply fab! No, or Yes, on Measure C? It's June already and on June 5th Napa County voters will be asked whether or not to approve Measure C. The entire Napa Valley is in a tizzy over Measure C, so today I sat and read the 'Full Text of Measure C' (Ordinance No. 2018-01) in Vinomaker's copy of the Napa County Voter Information Guide to try and make some sense of the arguments for and against this contentious measure. Oh my goodness, I could not make head nor tail of it. Measure C's intent is to amend "the Napa County General Plan and Zoning Ordinance to establish 'water quality buffer zones' on parcels greater than one acre within the Agricultural Watershed zoning district and would limit tree removal, including both oak and non-oak species, within those zones." Whaa? I'm not quite sure what that even means. There is way too much legal jargon, in the reading of this measure, to have it be understood by normal people. One of the criticisms of the 'No on C' folks by the 'Yes on C' folks is that the No-folks have more money and so have the wherewithal to mail many more glossy pamphlets to the voting public. A small, unscientific survey, by me, over a two week period did indeed uphold that grievance; 6 brochures for the No-folks and 2 for the Yes-folks. (Just this morning, Vinomaker told me he had received even more and had promptly put them straight into the bin.) Well, Yes-peeps, we don't live in Communist Russia (even Russians don't anymore because Communism doesn't work, well, except for the elite). It's a fact of life that some people/groups just have more money than others. Get over it! If I could vote, and I can't, I would be a NO on Measure C. The initiative, although well intentioned, is written very badly and is extremely vague. Can we say, costly lawsuits? Yes, we can.